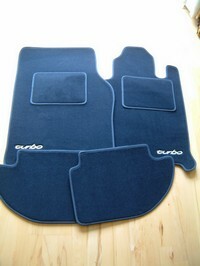 We can now supply custom made sets of car floor mats in any colour, with matching or contrasting edging, to specifically suit any car. They're British made, foam backed, tough and durable. You can customize them with optional heel pad and embroidered logo or words anywhere on the front mats, in your choice of colours. Note: we will assume logo is white on outside edge of mat as illustrated unless informed otherwise. Copyright logos cannot be added, but model numbers are suggested. Delivery is typically 1, but can be up to 2 weeks. "Fully satisfied with the service received regarding the Road Pilot Micro Go. This was found to have a damaged installation disc when unpacked which was attended to straight away by Phil for which I would like to add my thanks for his very prompt attention. "